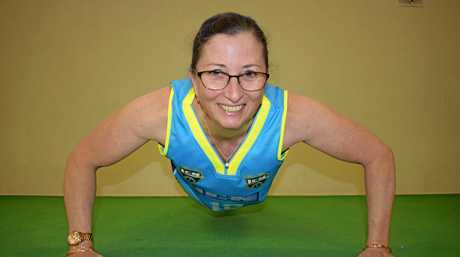 A Roma grandmother has broken a national record for bench press, claiming her seventh national title in Brisbane last weekend. Fiona Flanders took the stage at Iron Underground powerlifting gym, competing in the under 58 kilograms category for 55- to 59-year-olds and pressed 58.5kg, breaking the national record. The 55-year-old then got back on the bench and pressed 60kg, breaking two national records for her age group in one day. Flanders said it was exciting to break the national record. "It's pretty exciting holding the national record because I've had an injury for a couple of years and I haven't been able to move enough to get lean enough to compete in bodybuilding," she said. "So to be able to achieve at this level in powerlifting after not being able to compete is very satisfying." Flanders who balances the life of a grandmother and a training admits she was on babysitting duties the morning of the competition. "I love my grandchildren. I was looking after my youngest Jack who got up to a bit of mischief in his cot and I believe he really helped reduce my pre-comp nerves," she said. Flanders, also a personal trainer said breaking the record gives her that extra credential. "As a PT I like to be able to walk the talk, I don't just tell people how do to stuff, I can actually do it as well," she said. "I think it's very important for women to have upper body strength as they get older and I encourage any older women who feel nervous about joining a gym to give it a go. It's a very supportive and safe environment to do your exercise." Flanders is aiming to break a new record in April.